The sheet on the right was previously washed with soda, cooked with sumak leaves and was soaking in water with iron while rolled up with celandine. 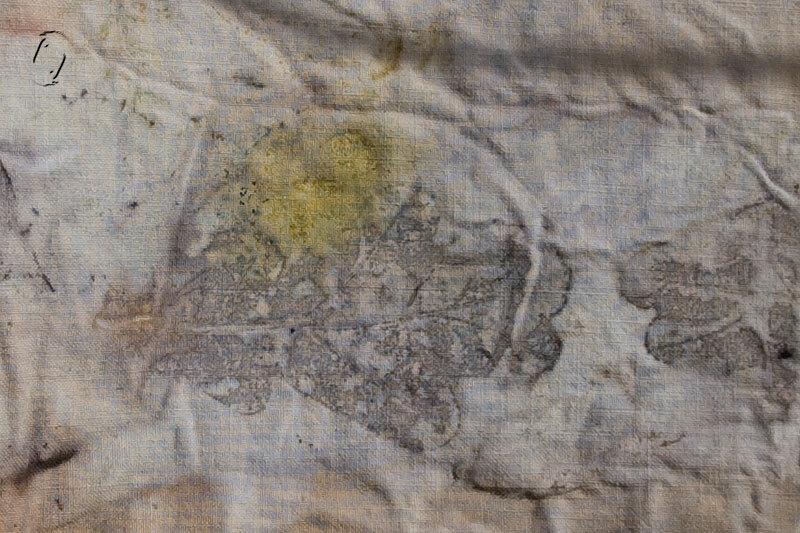 The pillow case similar although no tannin before but soaking in water with oak leaves while printing. Sage leaves = absolutely nothing. Maybe a pale shade of yellow? Put cloth in bucket of whatever = only the outside layer takes any colour at all. My mystery cloth just lost whatever I put on it previously and didn’t take anything from the leaves it had been rolled up with. None of these cotton rags were properly mordanted, which is the next process I’ll be trying to see what the difference is. Tannin and aluminium acetate, some with sea water and aluminium. Some with iron as well, before or after. But I probably won’t get to actually dyeing them until next summer. Rhubarb leaves will be on the menu as well. Another set is brewing – hoping for prints from lupine leaves among other things. 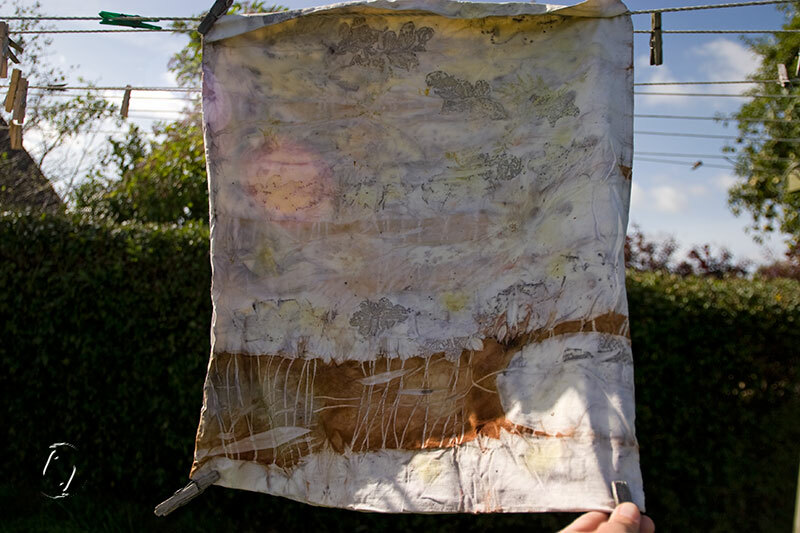 Funny thing though, the celandine dyed sheet is brown – but when put into water again, the water turns yellow. Tid til at åbne de sidste pakker jeg præparerede d. 14. august. Den første omtalte jeg d. 21. august, den er nu tør og afventer yderligere eksperimenter på et eller andet tidspunkt. Der kom ikke så meget ud af det, svaleurt giver stadig brun ved langtidsfarvning og kun egebladene lavede print på stoffet. Det ene stykke stof mistede de print det havde inden og er nu næsten “rent”! Jeg ved ikke helt hvad det er lavet af, det er en slags kanvas og virker ikke syntetisk, måske hør? I do hope to improve with this – quite a lot…. Leaf printing on cotton is such a challenge. I have had best success with sea water, followed by soy mordant–three layers. I have been using eucalyptus leaves… and with those the thing that made the biggest difference apart from mordant was rolling around a cast iron pipe. 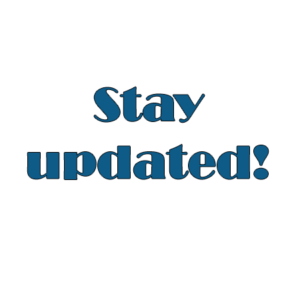 Keep experimenting… this process is just so rich and interesting. I love the rich brown part of your pillowcase! I’ll definitely try the sea water and soy milk then! I don’t have eucalyptus here, so I’d have to import the bark and leaves or try to get some winter hardy species – which I don’t know if they even dye as well. They might have them in the CPH botanical garden, but scooping up bagfulls of leaves might be considered a tad rude. 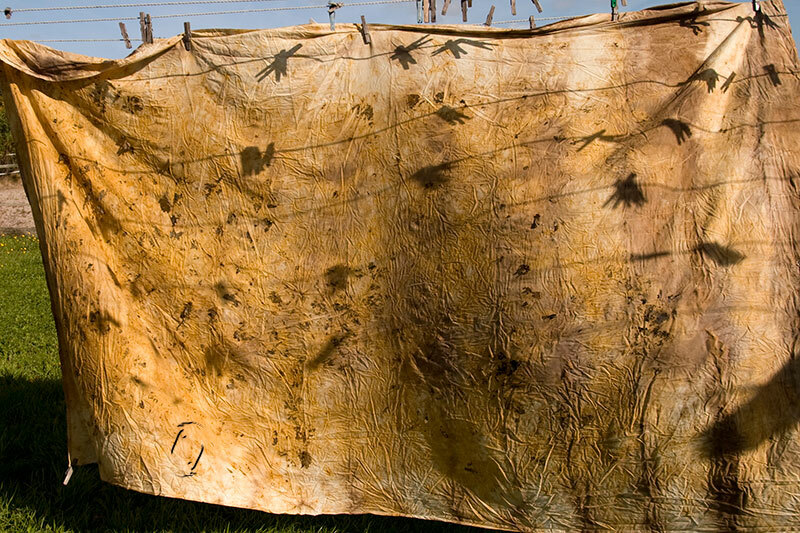 I am always interested to see what results others can achieve with solar dyeing–I haven’t had a great deal of luck, but the sun is an excellent source of free heat… I will be gripped to see the outcomes of the mordant expermiments too.